“We reached the entrance to Edo’s outer bay at about 2:00 P.M. Moderate elevations frame the bay in a hilly landscape; mountains rise higher at a distance. The hills sometimes end in bluffs at the waters edge: picturesque, lush with vegetation, and crowned by sublime and lovely pines. Elsewhere the hills expire into meadowed valleys and small flats. Towns and villages often occur there, as well as green, handsome rice paddies wherever tillage is possible. Paddies, rocky knolls scattered among them, and a dotting of groves add up to a fetching aspect. To heighten the charm, a haze cloaks the land in a delicate gray, softening and calming the impression. And, as foreground, the deep blue sea harmonizes beautifully. “… When we reached our limits, we saw a city, way off, spreading far and wide at the bay’s upper end. Located there, the city must be Edo. But under strict orders from the commodore, we could not approach near enough to confirm our assumption. 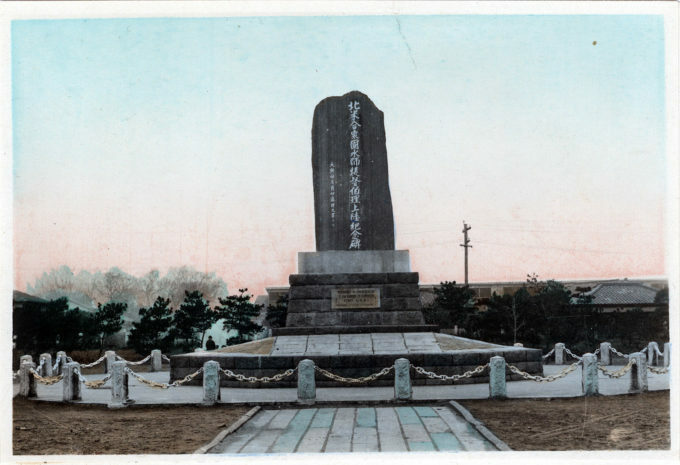 Monument, c. 1949, erected in 1901 commemorating Commodore Matthew C. Perry’s “Black Ship” fleet arrival to Japan in 1853 at nearby Kurihama demanding Japan open itself to foreign trade. The Matthew C. Perry Memorial that was dedicated on July 14, 1901, at the spot where the American naval commodore first landed on July 14, 1853 to deliver the US president’s letter and the subsequent Treaty of Peace and Amity. The monument is now the centerpiece of a small seaside park (“Perry Park”) at Yokosuka, Japan. The Perry monument was located in Kurihama. but the village was incorporated into the city of Yokosuka in the 1950s. The plaque was not on the base of the monument when it was dedicated in 1901 and is believe that have been added to the monument sometime between 1913 and 1940.